When I opened this book, I was excited! The pages inside the cover show a lovely exploration of paint and color. I knew this would be fun to use in the classroom. 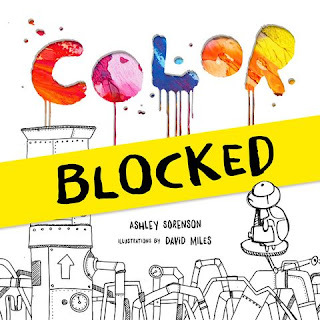 The rainbow of color on the first page was an attention-getter for my rainbow-loving students. The black and white line drawing of fantastical machines showed us how to use lines with curves, angles, bits of shading and texture. 1. Using the page with the black & white line drawing for inspiration, discuss the different kinds of lines and shapes. What do you notice? 2. Follow up by offering students the opportunity to draw their own machines, using black crayon or black permanent marker. (We used black crayon and it worked well.) Encourage them to draw pipes where later, color can appear. 3. Flip to a later page in the book where the “color explosion” occurs. Provide red, blue and yellow watercolour or tempera paint, with paintbrushes and water. Mix and explore!